The prominent Democratic U.S. senator called out pharmaceutical companies during an appearance on Good Day New York. New York Senator Kirsten Gillibrand has called out opioid companies for actively opposing the legalization of marijuana. In a recent appearance on Good Day New York to discuss gun control, the American attorney and politician was asked about her support for legalizing marijuana and in her response denounced the actions of pharmaceutical companies. While marijuana has never been responsible for a fatal overdose, opioid overdoses account for an average of more than 90 Americans every day. The powerful class of narcotic drugs acts on opioid receptors on nerve cells in the brain, spinal cord, and other areas to reduce pain messages to the brain. Over time, opioids change the way the brain’s nerve cells function, increasing addiction risk. Opioids acting on receptors in the brainstem can depress a person’s breathing and cause sedation, creating an environmental that can lead to a fatal overdose. Findings in numerous studies indicate that making marijuana legally accessible is associated with a drop in opioid overdose rates. Medical marijuana has also demonstrated itself as effective for pain management. 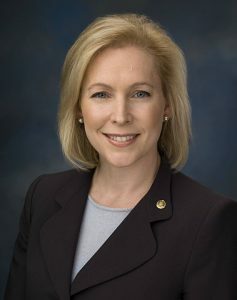 Sen. Gillibrand is a cosponsor of the Marijuana Justice Act, joining with New Jersey Senator Cory Booker to propose ending federal prohibition on marijuana. The legislation would remove marijuana from the Controlled Substances Act, expunge federal marijuana convictions, and penalize states if they haven’t legalized marijuana and racially disproportionate enforce cannabis laws. Sen. Gillibrand also responded to a question regarding the myth that marijuana serves as a “gateway drug” to more dangerous substances. Learn more about the opioid crisis in America and how cannabis may be able to play a role in solving the problem HERE. While marijuana remains illegal under federal law, 29 states and Washington D.C. have legalized medical marijuana. Nine of those states plus Washington D.C. have also legalized recreational marijuana. In addition to the Marijuana Justice Act that proposes ending federal marijuana prohibition, lawmakers at all levels have also made moves to protect cannabis operations in states and cities where marijuana is legal from interference from the federal government. Earlier this year, U.S. House Rep. Barbara Lee of California, which has legalized both medical and recreational marijuana, introduced legislation that would prohibit the federal government from using federal funds to crackdown on state-legal marijuana. The city council in Berkeley voted last month to become a “sanctuary city for cannabis” by prohibiting city agencies and employees from assisting federal prosecutors around marijuana enforcement. In Colorado, Sen. Cory Gardner has actively protested the Justice Department’s threat to interfere with state-legal marijuana by holding up confirmations of 22 key appointed figures. More than 60 percent of Americans believe that marijuana should be legal — the highest level of support in nearly half a century.